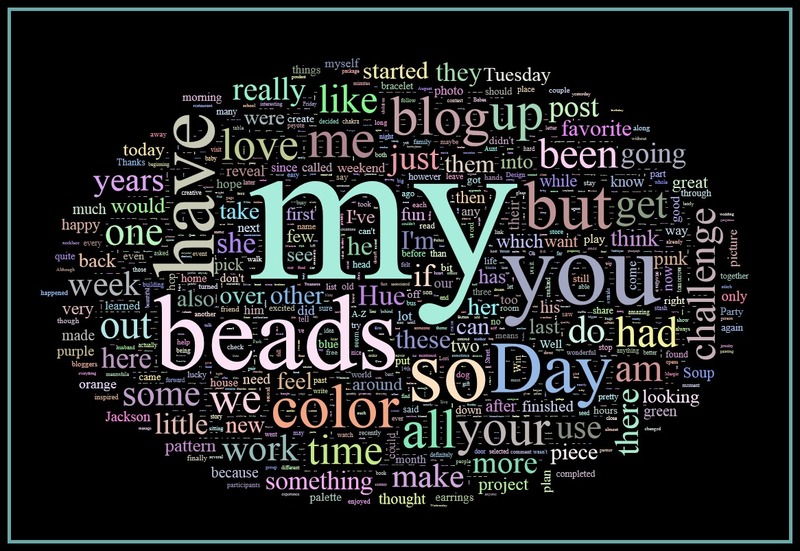 Amybeads: Word Cloud & Bead Show & Free Beads! 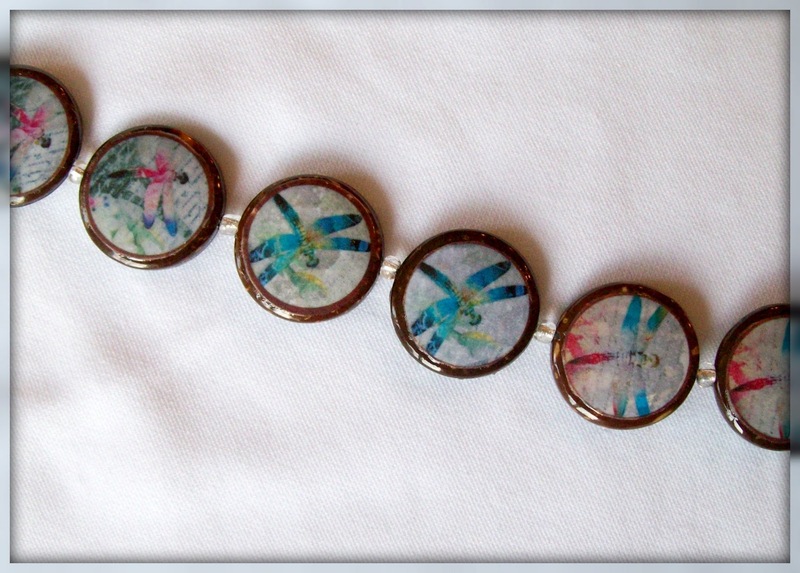 First I saw it on Sally's blog, Wild Sally Road....then I saw it on Shirley's blog, Beads & Bread....and I think it's so cool, I had to try it! You just go to this site, click on Blogger and type in your blog name and voila! And while I really enjoyed all the words in my cloud....I think I am going to try to stop saying "my" so much! LOL..... that giant "my" took me by surprise.....do I sound like a three year old??? MY beads, MY blog, MY challenge piece, MY project, MINE MINE MINE!!!! Is it awful??? In other news I went to a bead show this weekend and it was MARVELOUS! It felt really good to splurge on a few things, and to grab some things I felt like I really needed!!! 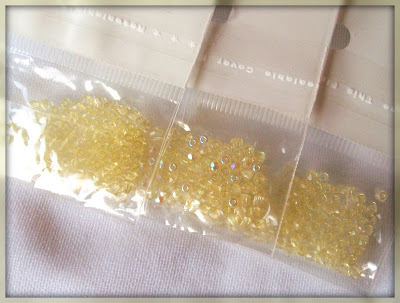 I picked up a bit of yellow, in preparation for entering the Fashion Colorworks competition. Although having gotten them home, most of the hues seem a little bit off from the color requirement...but we'll see when I get going!!! I'm dying of happiness with those "farfale" beads in the last photo. They are crystal lined with gold a/b luster.....they are scrumptious. I thought they were so cute!!!! They were from a bead vendor there called Priscilla Beads. 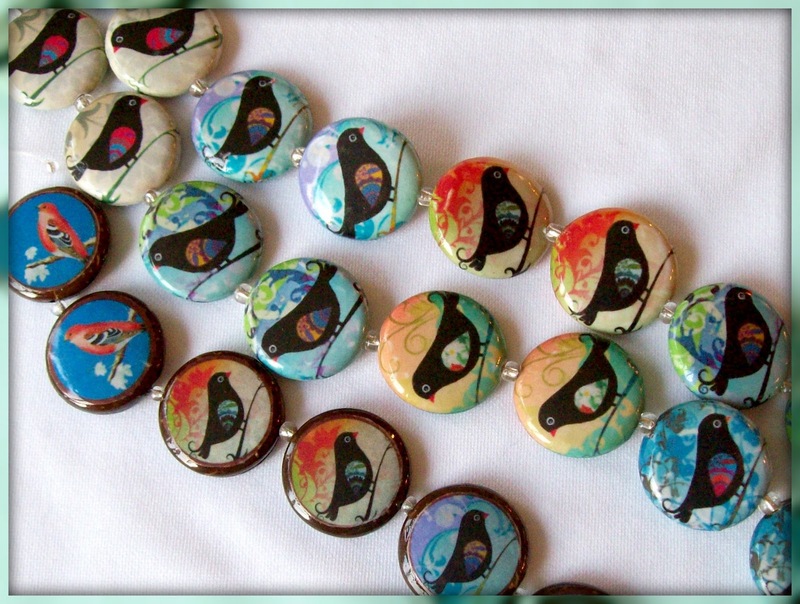 I had a hard time selecting from her because there were so many adorable decoupaged beads at her booth. In honor of so many bloggers selecting a Word for the year, I would like to give this strand away! All you have to do is leave a comment. I will draw a winner on Friday night. 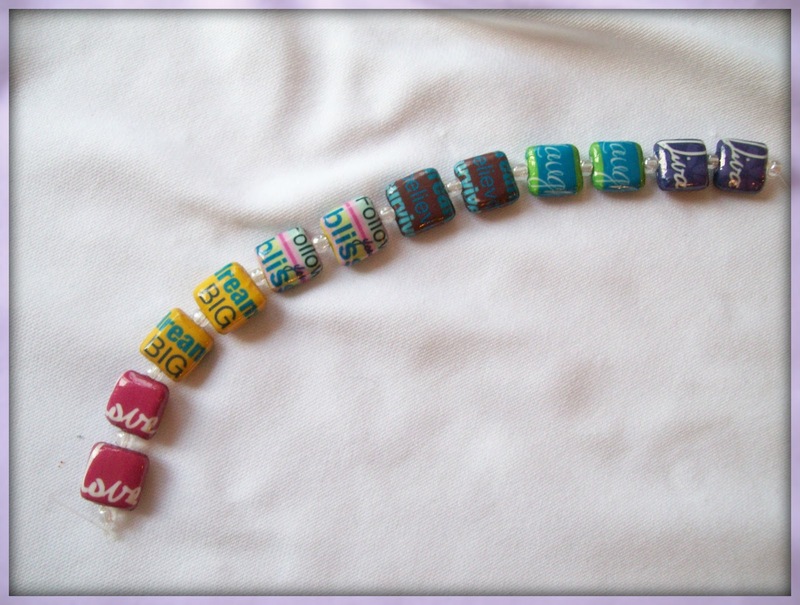 And for a double entry - let me know if you would be interested in taking part in a bead kit challenge with those decoupaged beads! I'm thinking definitely $10 or under including shipping.....also wouldn't start until the big festival is over mid-February! 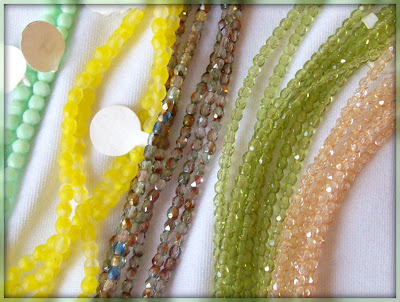 The word beads look like a lot of fun! 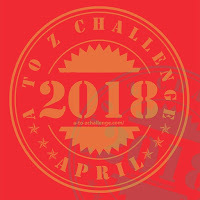 A challenge kit sounds interesting. OMG I absolutely love the bird and dragonfly beads so would be up for a challenge kit...I wouldn't mind winning the beads you have up for grabs too! I tried t do the Word Cloud but it keeps giving me an error so I shall keep trying. I am intrigued to see what mine will say...I have a feeling I say MY too much too! Glad you had a good time at the show. 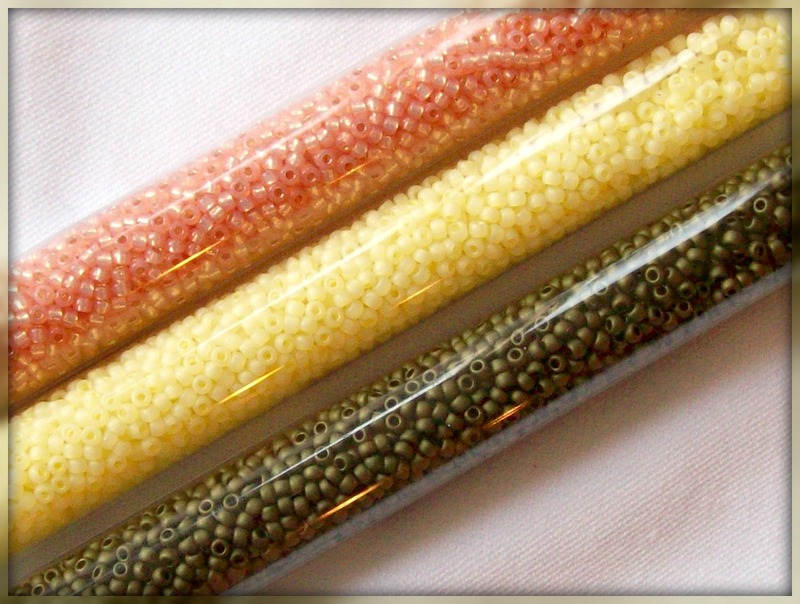 The beads you found are great and the decopaged ones are wonderful! 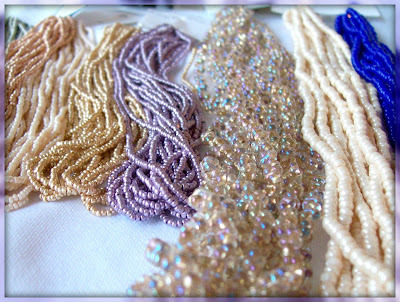 I love the word beads too. They're really fun! Now first you know I am totally up for any challenge you have but as the budget has now strangled and possibities for any purchases I will just have to watch! 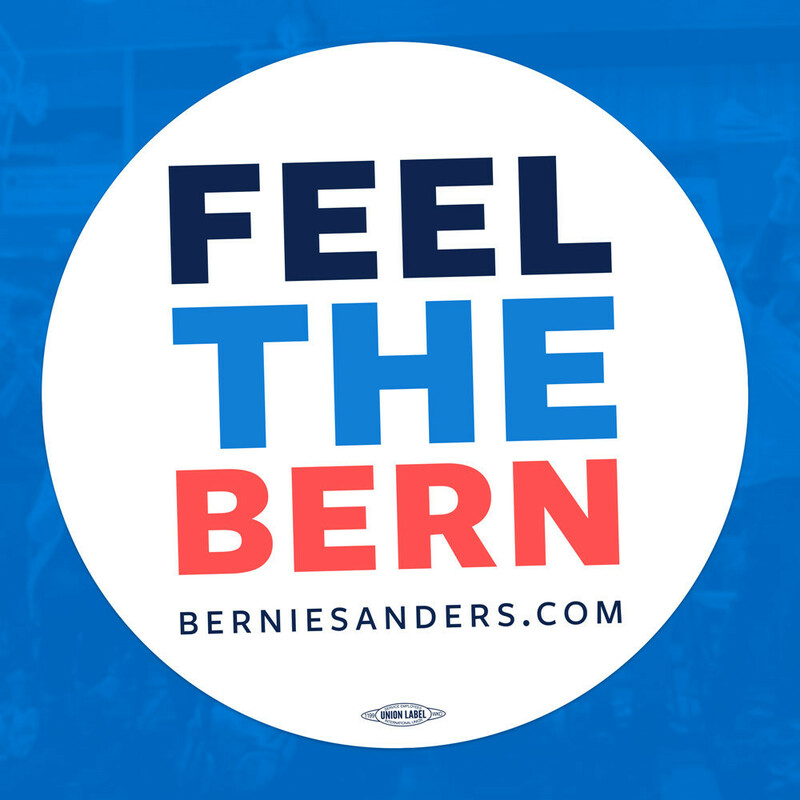 I will have to check out the word cloud thingy soon. i have to try that word thingy...i'm wondering what my main word would be?! i love all your new treasure...what fun to go on a spree like that! we don't have any big bead shows around here which makes me sad. i'd have to travel up to portland...hmmm, road trip time? !